DoF's camera-like display lets you enter parameters by pointing and dragging and then shows you the results immediately. It's unique double-cone display illustrates blur as a function of subject distance. Unlike most other calculators, DoF determines depth of field taking both diffraction and focus blur into account. Diffraction can be a major factor, especially for newer digital cameras with high resolution and smaller sensors. 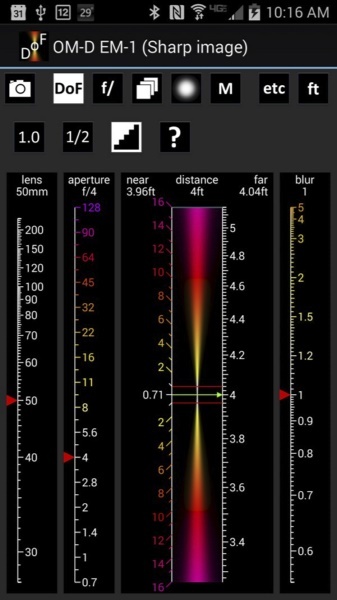 Like most other calculators, DoF can compute depth of field from aperture and focus distance for a given lens. What is more useful however is that given a range of distances, DoF can determine the f stop and focus distance that produce the sharpest image taking diffraction into account, and what the worst case blur will be. Standard depth of field equations break down for macro photography – DoF has a Macro mode that lets you determine depth of field by measuring the field of view at the subject distance. From the field of view it then computes magnification and from magnification the depth of field. DoF has a Focus Stacking mode that shows you how to increase depth of field based on combining multiple images focused at different distances. DoF can tell you exactly how much blur your images will have at each distance. The reference manual includes a set of images that illustrate what different blur levels actually look like. Confused about circle of confusion? To calculate depth of field, you need to know what size circle of confusion to use. The circle of confusion specifies how much blur you find acceptable – too large a value leads to soft images while too small a value makes for too narrow a depth of field. The best value depends on how you are going to view your images and various other factors. 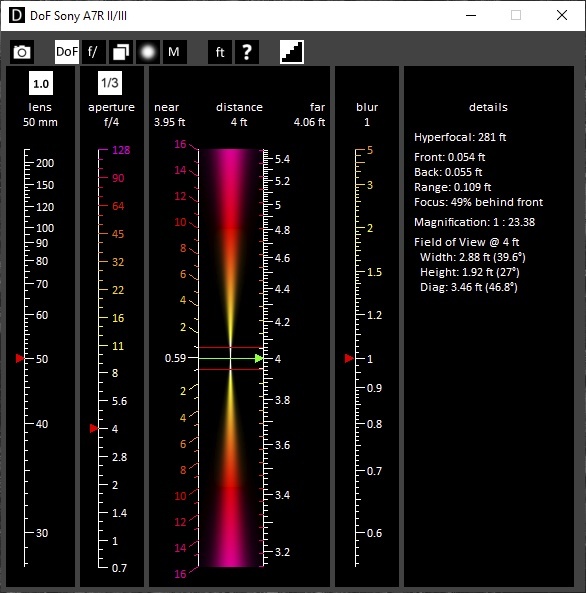 DoF's Camera dialog gives you full control over all the parameters that determine circle of confusion and the reference manual includes a thorough discussion of the issue.